TMJ pain: if you’ve suffered from it, you probably already know what it is. If you haven’t, it may require a bit of visualization to make the connection. Some might say TMJ is jaw pain, or something that causes a clicking in your jaw when you open and close your mouth widely. 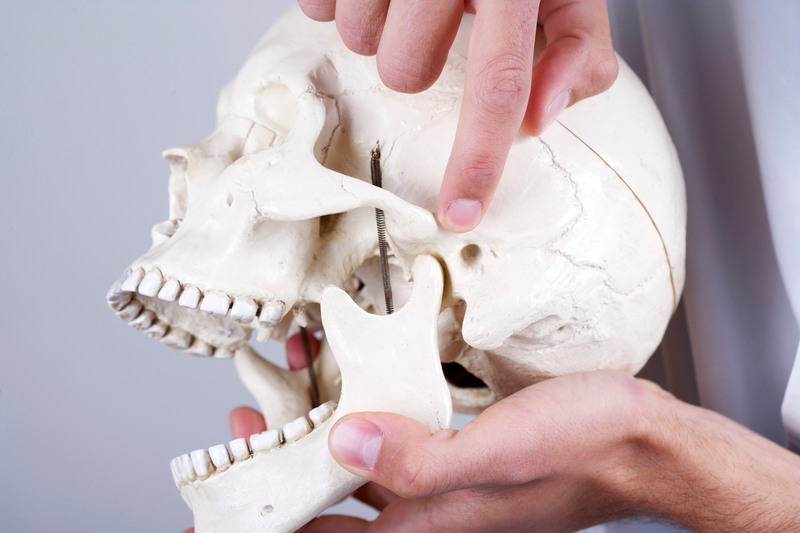 There’s a lot more to know about what the TMJ is, and when it poses a problem. TMJ stands for the temporomandibular joint. It’s an important joint formed by your skull and your jaw bone and involves the muscles needed for chewing.1 Your TMJ acts like a sliding hinge, and connects your jawbone to your skull. It is responsible for opening and closing your mouth, allowing the jaw to move smoothly up and down and side to side, and enables you to talk, chew, and yawn.1,2 A common mistake people make is referring to TMJ pain simply as TMJ. When you experience pain in this area, your chiropractor or dentist may refer to it as a temporomandibular disorder, or TMD. How Can I Manage TMJ Pain? Another treatment that has been proven to help is intraoral myofascial release, a technique certain healthcare practitioners, such as chiropractors, can use to release the muscles surrounding the joint, accessing them from the inner side of a person’s cheeks.7 The TMJ is a joint after all, and chiropractors are experts on muscles and joints and can assess the function of your TMJ and help determine the best way to manage your pain. Whatever method you choose to alleviate your TMJ pain—self-care, cognitive behavioural therapy, or co-management between a dentist and your chiropractor—know that there are options that can help. You can talk to your chiropractor to help choose the method that is right for you. 1 Yuill E, Howitt S. Temporomandibular joint: conservative care of TMJ dysfunction in a competitive swimmer. J Can Chiropr Assoc. 2009;53(3): 165-72. 2 TMJ Disorders. National Institute of Health website. https://www.nidcr.nih.gov/oralhealth/Topics/TMJ/TMJDisorders.htm. Published April 2015. Accessed February 14, 2017. 3 TMJ disorders: Overview. Mayo Clinic website. http://www.mayoclinic.org/diseases-conditions/tmj/home/ovc-20209398. Accessed February 1, 2017. 4 George JW, Fennema J, Maddox A, Nessler M, Skaggs CD. The effect of cervical spine manual therapy on normal mouth opening in asymptomatic subjects. J Chiropr Med. 2007; 6(4): 141-5. doi: http://dx.doi.org/10.1016/j.jcme.2007.08.001. 5 Vinjamury SP, Singh BB, Khorsan R, Comberiati R, Meier M, Holm S. Chiropractic treatment of temporomandibular disorders. Altern Ther Health Med. 2008; 14(4): 60-3. 6 Brantingham JW, Cassa TK, Bonnefin D, et al. Manipulative and multimodal therapy for upper extremity and temporomandibular disorders: A systematic review. J Manipulative Physiol Ther. 2013; 36(3): 143-201. doi: 10.1016/j.jmpt.2013.04.001. 7 Randhawa K, Bohay R, Côté P, et al. The effectiveness of noninvasive interventions for temporomandibular disorders: A systematic review by the Ontario Protocol for Traffic Injury Management (OPTIMa) Collaboration. Clin J Pain. 2016; 32(3): 260-78. doi: 10.1097/AJP.0000000000000247.